Bangalore, to say the least, is the most beautiful city of India. Bangalore is presently, the fastest growing city in Asia and the fifth largest city in India, with a burgeoning population of nearly four million. 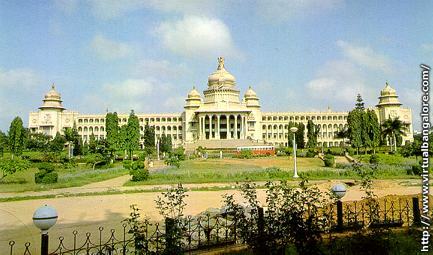 It is also the capital of the Indian state of Karnataka. Thanks to the growing influx of foreign nationals, Bangalore has now become a "global cultural melting pot" of sorts. It is a perfect blend of the rustic and the modern, a tranquil union of different cultures and peoples. While it is better known as the Garden City of India, it is also acknowledged as the Silicon Valley of India. Whatever you may call it, to a Bangalorean, it is the Best place on the face of this earth. Bangalore, is one of India's most charming cities. Today, it is India's fifth-largest city, the momentum of its industrial and commercial growth unequaled in the country. Before the British influence, Bangalore was, on and off, for years the capital of what was then known as Mysore and witnessed the coronations and reigns of several monarchs belonging to great southern dynasties, the Kadambas, the Hoysalas, the Chalukyas and the Vijayanagar emperors. On one historic occasion it was spectator to the deposition of its king, Chikka Krishnaraja Wadiyar, by his audacious general, Haider Ali. The City was founded in 1537 by Kempe Gowda, a Vijayanagar chieftain, who, rather short-sightedly, built watchtowers at four cardinal points to mark the limits he envisioned Bangalore would grow to. However, Bangalore has far exceeded it boundaries set by its well-meaning founder, with expansion proceeding in a planned, orderly manner and far-sighted town planning setting the framework for industrial growth. Bangalore's industrial take-off was spurred by visionaries like M. Visvewaraya and Seshadri in the early decades of the 20th century, at a time when the industrialization of India was little thought of. Visveswaraya, an engineer of considerable renown who turned statesman, was an innovative thinker and an indomitable trail-blazer. As Dewan of the princely state of Mysore he promoted and encouraged industry, both in the public and private sectors, in pre-independence Bangalore. Today, Bangalore is the country's boom city with eight huge industrial belts housing well over 10,000 industries. Amongst the leading research institutions it is home to are the world-renowned Indian Institute of Science, the National Institute of Mental Health and Neurophysics, the Indian Space Research Organization, the Indian Institute of Astrophysics and Aeronautical Development and the Raman Institute of Physics. Aptly named the 'Garden City', it boasts of an amazing number of flowering trees and parks. With splendid pink cassias and golden acacias blooming, with jacarandas flowering in purple majesty and the gul-mohurs lighting the roads with their flame-orange brilliance, the city is a sheer delight to simply wander around in. Bangalore can be the ideal starting point of an exciting exploration of the fascinating, architecturally-rich heritage of Karnataka; every important tourist attraction in Karnataka is within a day's journey reach. While Bangalore has its share of ancient forts and temples, it is also the perfect spot for soaking in the sun and local colour at the finest and friendliest of hotels. And it is shopper's paradise where Karnataka's fabulous traditional silks, coffee, jewelry and handicrafts can be bought at sleek, reliable shops. Located at an altitude of 920m. (3,021 ft.), it boasts of delightful weather all year round, registering a mean temperature of 27.1 C (80.8 F) in the warmest month of April and 20.48 C (68.8F) in the coldest month of January. Evenings are cool the year-round. Bangalore receives both the south-west and the north-east monsoons, getting an average rainfall of 87 cms. October, November are the rainiest months. Often referred to as the 'Fruit market of the South', the lush, fertile soil of the Bangalore region produces in abundance a variety of fruits and vegetables- grapes, mangoes, banana, custard apple, sapodilla, jackfruit, melons, guavas. Having spent the most crucial part of my life in bangalore, I could go on and on describing Bangalore to its slightest detail. But words seem in inaffable to complete the picture. If you haven't been to Bangalore ever, I'd suggest you put it on your "places to go in this life" list.